significant contributions to archery businesses and the sport of archery & bowhunting in the past decades. Bob was inducted into the Minnesota Archery Hall of Fame. And yes, he is still actively hunting for those Trophy Whitetails. Congratuations to Bob from all of us at The Knit Tree, and special thanks for sharing your knit Winona Camo System with us so we can still offer it to the supporters of Winona Camo products. Read more about it at the Minnesolta Archery Hall of Fame web page. 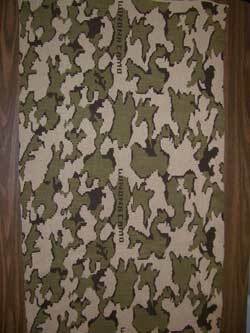 I have had clients ask for more photos of the knit camouflage fabric in larger sizes, all in the same place, so they can compare the color ways. I hope this article will be a good resource to help in comparing the different knit camo color ways that The Knit Tree offers in the Winona Knit Camouflage line of garments and accessories. 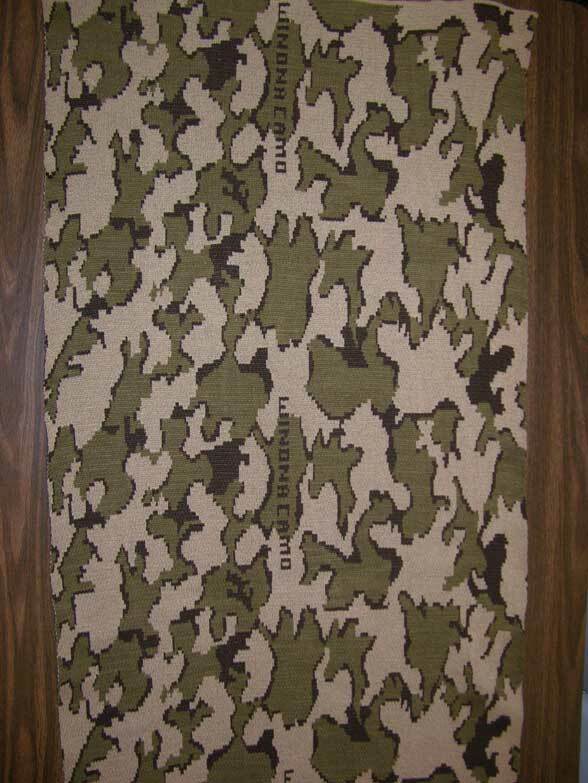 I will add a knit camo yardage photo as they become available as well as a product image. This is particularly important in the different brown and grey tone combinations. Of course, the wonderful thing is that in custom knitting you can create your own color way as long as you choose three colors from our available yarn charts. 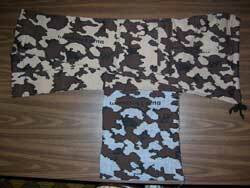 Color Way is the term to describe how the 3 differnet colors are put together to form the Winona Camouflage knit fabric that is used in all the knit camouflage hunting clothes and knit accessories. 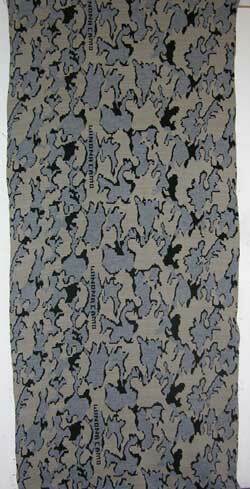 Elite Knit Camouflage which is a blend of acrylic and merino wool will add a heather look. The merino is a natural fiber so has a different hue then the acrylic yarn and therefore is never an identical match in color. This actually adds to the camouflage look by adding the variations. We always try to take the garment photos on a model in an outside environment for natural lighting in the same area for better comparison. The yardage photos are normally taken indoors, but as new yardages are knit, I will get outdoor photos. We are always trying to improve our photos to help the client make their color way choice. New Dye lots of the same color of yarn can affect the color way slightly. If a client orders a set at the same time, example: jacket and pants, I always use the same yarn dye lots for all pieces. If pieces of a set are ordered at different times, the same dye lot may not be available. These are just slight variations and should not have a huge effect on the camouflage knit outfit. The new fashion season can have a bigger affect. Sometimes colors are discontinued and a color close in value is added in its place. Camel is the best example. Some years it comes in a lighter tone and sometimes a little more brown dye is added which darkens it slightly. This is most prevalently seen in our photos of garments done in color way E: camel/black/brown. Over the years some of the garments have a lighter or darker look to the color ‘Camel’. Sometimes the browns come in with more red in them giving them a slightly lighter look. All these things are minor changes in the overall color way combination. 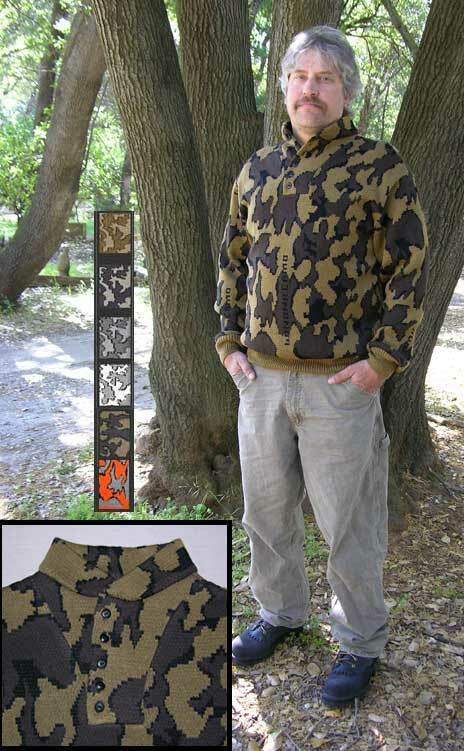 Since The Knit Tree is a cottage industry and custom knits these camouflage knits, we do not mass produce any of these knit camouflage garments or accessories. We do not have large quantities of a color specially dyed such as a knit factory would do. 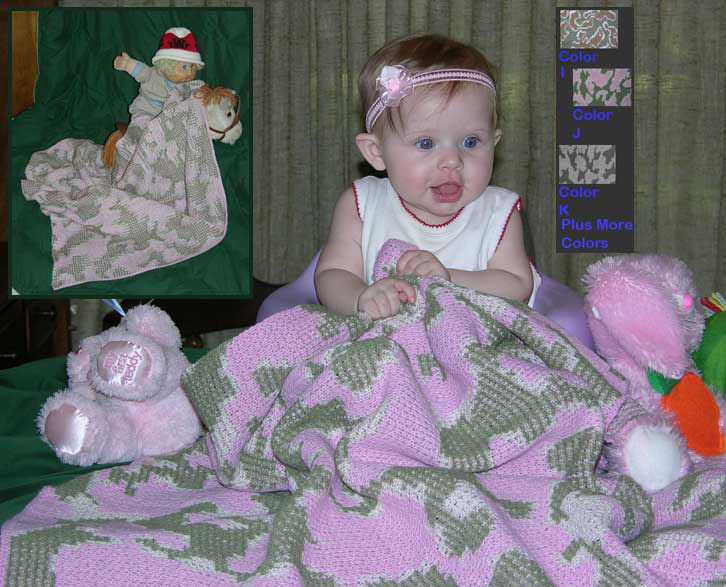 Therefore, we rely on the yarn availability from our US suppliers. Mocha: the earlier mocha had more red in it as shown in the original little swatches of color way D. and looked ‘sunny’. This color was discontinued and a darker mocha replaced it. The photos shown in this article are current with the Deep Mocha which is now available. Dark Grey has been discontinued in the acrylic colors and is only available in merino. So color way F: Dark Grey/Black/Grey is only being offered in the caps until my supply of dark grey is depleted, unless my yarn suppliers bring it back as a future color. Color way R: blaze/black/grey is only offered in knit Classic: acrylic because the orange color available in merino wool is not vibrant enough to meet the hunting requirement of most states. NOTE:Click on all images to see an enlargement of the photo! for the color ways you want to examine. Winona Knit Camo Cardi in classic acrylic fiber color way D.
The zipper extends into the shirt collar. 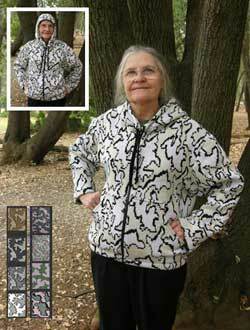 Other options are available for this Winona Cardi Jacket that Bob Fratzke made famous. 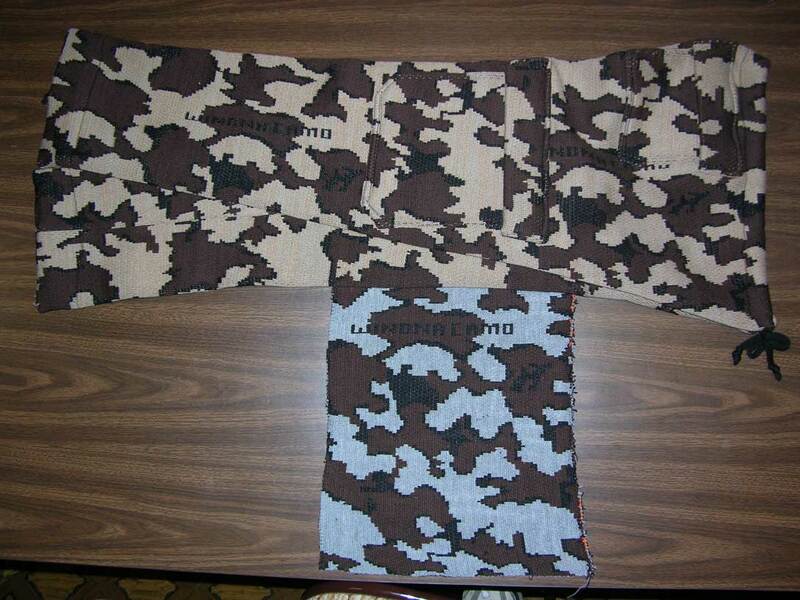 You can select your trim color (the color of rib at bottom and cuff in any of the 3 colors in the camouflage design. You can also select a crew neck instead of a shirt color. 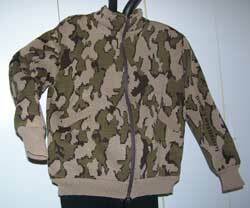 Purchase this camouflage cardi jacket available in sizes small thru 3x in the Knit Tree's online store. It is available in the Classic Winona Camo© Cardigan Jacket and Elite Winona Camo© Cardigan Jacket fabric..
Winona Camo Cardi in The Elite Fiber in color way E.
The Elite Winona Cardi in color way E is shown to the right. The body shape is the same as the Classic cardi shown above in color way D. Notice how the option choice of using brown for the trim color changes the look of the Cardi Jacket.. Using a photo of the same cardi jacket in a different color way gives you another good comparison of how different colors can effect the look of the knit garment. 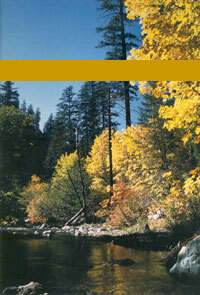 The environment of the hunting area can influence your choice of the color way you select for your camo hunting clothes. That is why The Knit Tree is giving you lots of choices. 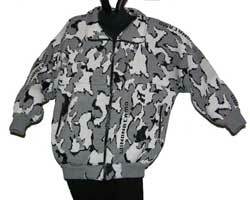 The camouflage pullover sweater to the left is another popular camouflage clothing. It is also in color way E. It is a basic pullover sweater with a crew neck line. A joy to wear for leisure or hunting. All the camouflage items are offered in all the different color ways. Purchase this camo pullover sweater in either the classic or elite fabric Winona Camo© Crew New Pullover . It is also available in sizes xsmall thru 3x.. Go to the online store camouflage category to see all the camouflage clothes and knit camouflage hunting accessories. The only thing different about color way Q and E is the first color in E is camel and the first color in Q is mocha. The photo to the right is the classic cardi jacket. It is identical to the photos above showing the cardi in color ways D and E. Each of these colors are just a personal choice dependant upon your hunting environment. The photo to the left is Bob Fratzke's famous fatique sweater. Bob told me it was very popular in his 1990 catalog. This sweater is only offered in Classic (the acrylic version) because the Elite version with the merino wool added was too heavey of a fabric to make button holes with my semi industrial equipment. It has a set in sleeve like the cardi jacket, for a more fitted armhole, ideal for bow hunting. The inset photo shows the variation of a tab front neck line with buttons and a small stand up collar. 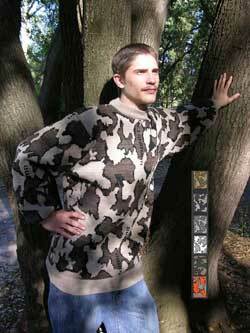 This neck line makes the knit camo fatique sweater stylish as well as useful. Go to The Knit Tree's camouflage category in the online store catalog to purchase this Winona Camo© Fatique Pullover you can select between several color ways and sizes xsmall to 3x. Each different style of jacket or pullover has different amounts of ease built into it dependant upon the body shape, so I include a specific sizing chart of measurements within each individual product description. Knit Winona Camouflage Vest lined with sherpa in color way S.
The photo to the left is a Raglan Sleeve Jacket with front pockets enclosed by a zipper. The zipper front closure extends into the shirt color. Color way S and Color way E both have Black and Brown, but E has color camel and S has color Grey. 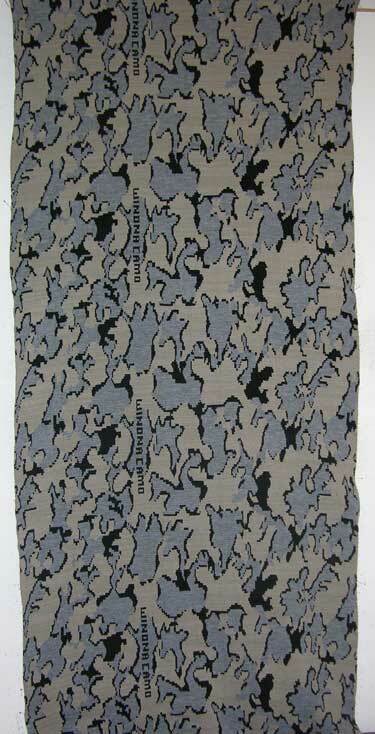 This does give a totally different look to the knit camouflage fabric. The model is also wearing the Survivor Hat made famous by Bob Fratzke. Bob even sent me his foam inserts left from his factory days, for these Survivor Hats. Sharon had so many requests for the lined Winona Camouflage Vest, that is also offered in The Knit Tree's online store. 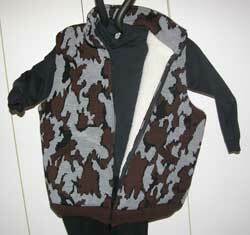 The vest is made like the camo Cardi Jacket except it is sleeveless. Both the Winona knit camo Cardi and vest are offered in lined and unlined versions. Color 3, brown was requested for the trim color. Go to The Knit Tree's camouflage category in the online store catalog to purchase this Winona Camo© knit raglan jacket, the matching Winona Camo© Survivor Hat and the Winona Camo© Lined knit Vest. All are offered in the different color ways and sizes. Winona Knit Camo Cargo Pants in color way G Snow Camo. Winona Snow Camo is a very popular color way. 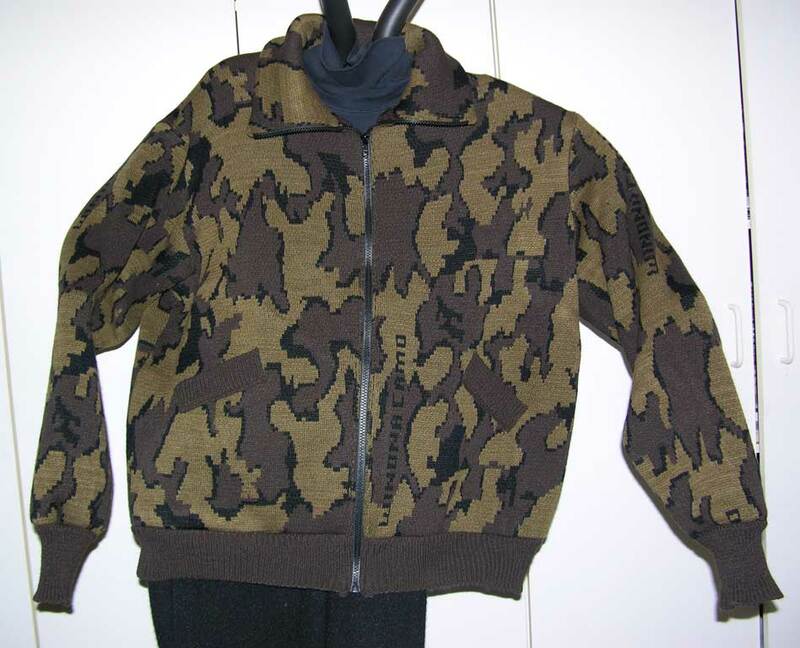 The photo to the left shows the knit raglan jacket, same raglan camo jacket shown above in color way S. Only the third color is different: brown in color way S and white in color way G, but WOW what a different look a color way gives. The Raglan Knit Camouflage Winona Jacket has a front zipper closure that extends into the shirt color. The front side pockets have a zipper closure to secure all items. 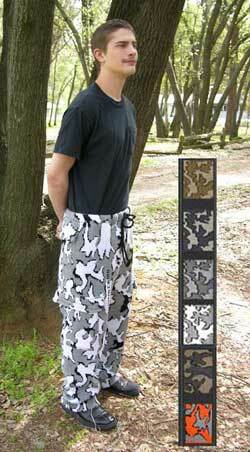 The knit Winona Camouflage Cargo Pants shown to the right are also a very popular camouflage item. The knit camo cargo pants have side and back cargo pockets, but you can purchase a simplier version like sweat pants. The waistband has both elastic and a draw string for firmly holding the pants up. The back is slightly higher at the waistline to eliminate that 'draft' when bending over in the crouching position. The bottom leg cuffs also have a draw string, The fuller leg eaisly goes over the boots, then it can be snugged tight with the draw strings. 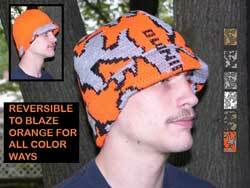 Winona Camouflage Knit Survivor Hat in Blaze Orange Color Way. Please refer to your states hunting regulations before ordering this Blaze Orange color way. Every state has different requirements for the percentage of orange color that must be present for hunting use. 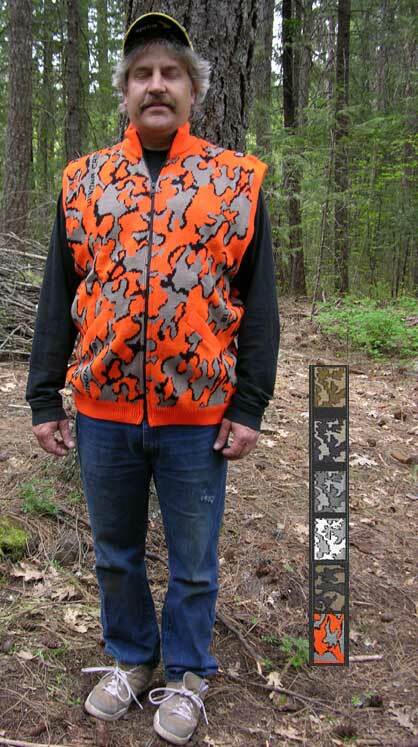 The photo to the left is the knit Winona Classic Camouflage vest in Blaze Orange color way. It has the inside kangaroo pockets that extend down to the bottom ribbing. This vest has a crew neck line. The photo to the right shows the camo survivor hat in the blaze orange color way. the inset picture shows the reverse side to solid orange. 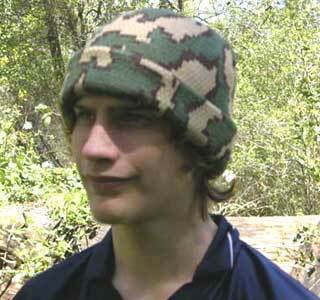 the knit camouflage survivor hat is reversible. Some order it with the inside solid orange and there is also a version where you can order it in other color ways that has camo orange on the inside. 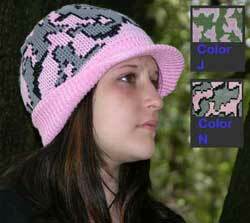 Look for all the variations in the Camouflage Hat Category of The Knit Tree's online store. There are lots of camouflage knit hat styles: including the camo ridge runner hat made famous by Bob Fratzke, knit camo visor hats, knit camo skull hats and much more. Look for all the variations of the Winona Camo© Hats and the Winona Camo© Blaze Orange knit Vest. All are offered in the different color ways and sizes. The photo to the left shows the knit camo boarder beanie in color way H. The boarder beanie is made like the skull hats except it is knit as a longer version so it can fold up for added warmth over the ears. The knit hoodie to the right is made with the Winona Camo design in color way O. It has the zipper front and inside kangaroo also known as hand warmer pockets that extend to the bottom hem. The hoodie comes in two versions, this one shows the hemmed version with no ribs, and there is a version that has ribbing at the bottom and cuff line. Knit pink camo is vogue. The Knit Tree's Baby Camouflage garments, blankets, booties, hats, and more are unique gifts for Baby. Color way J in its soft pink / ivory/ and light olive is one of the most popular color ways. 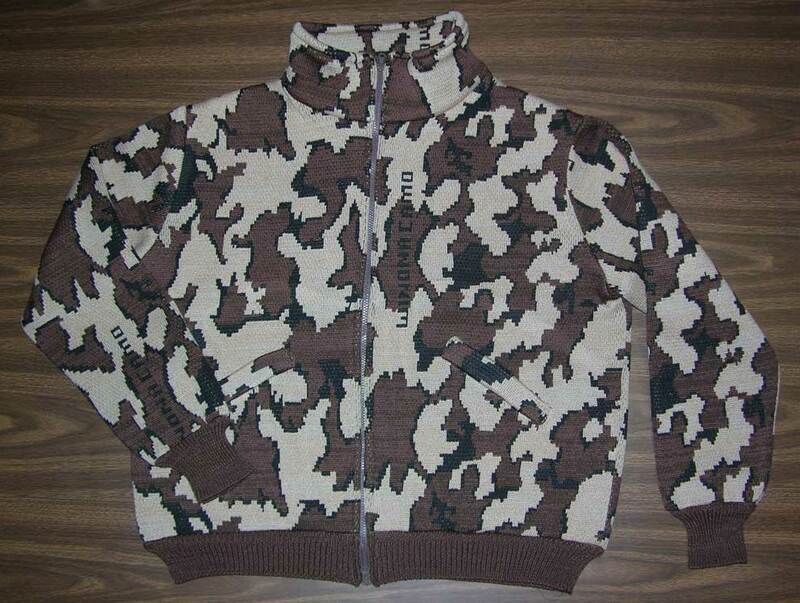 But if someone wanted to match Dad's hunting ensemble, the baby items are offered in all the knit camouflage color ways. The knit camo visor cap to the right is just another one of the great camouflage knit hats in the online store. The Knit Tree has clients request different colors ways then thosse that are offered. If several request the same color way, we offer it as a choice in our line. Such is the case with color way T: Camel /Black /Grey. It has light variations which would fall into the Snow Camel category of color ways. The color way swatch to the right of S: Grey / Black / Brown just shows you how the different color ways can give different contrasts. Over the years, The Knit Tree has found that all their personal clients have different preferrences dependant upon where they are hunting and what their other camouflage gear co-ordinates with. The feedback from camouflage customers is always important. When enough clients show interest in different camouflage items or color ways, The Knit Tree respondsd!!! 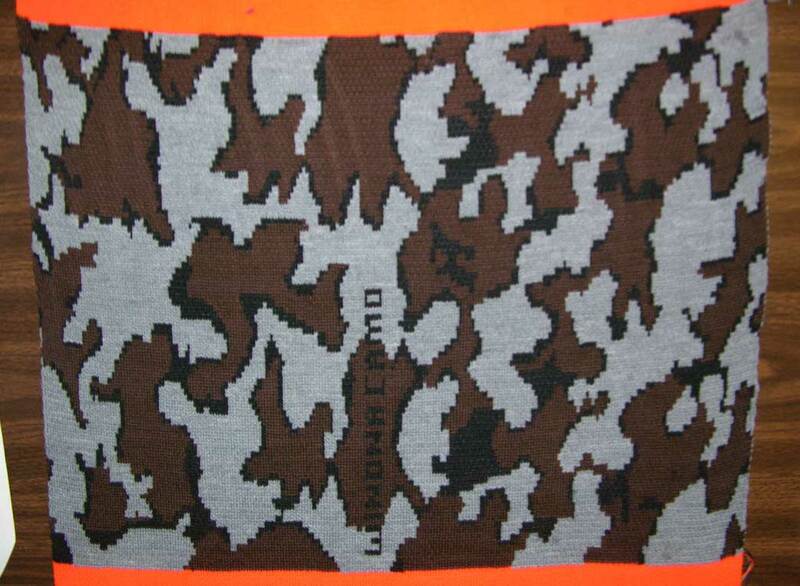 The brown tone knit camouflage color ways are the most popular with the hunters. Clients sometimes can't decide whether they prefer color way E, S, Q, or D. These comparison photos are meant to help this decision. Bob Fratzke would say any of these are great because they show a good contrast between light and dark. The rest is personal choice. 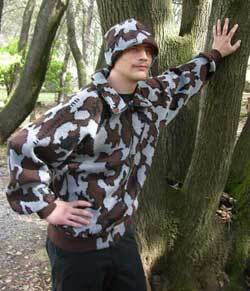 All the camouflage knit garements and accessories are custom knit. Therefore, the color ways can be your personal choice. If you don't see one you like, you can contact us to request your three colors, the only requirement is that you choice from the color chart of available yarn colors. 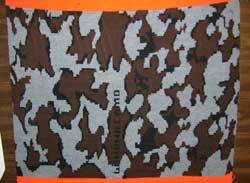 The Knit Tree offers several different color ways of the Winona knit camouflage garments and accessories. 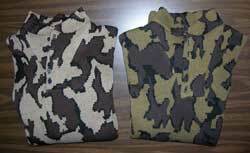 Different hunting seasons and hunting environments require different camouflage colors to be the most effective. In the end, it all becomes a personal choice. Have fun exploring the possibilities. 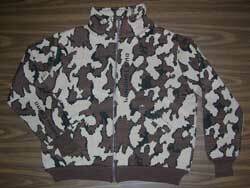 "All Winona Camo items by The Knit Tree are produced under license derived from Copyrights originated by Bob Fratzke."